As part of the design and build of the Integrated High Vacuum Test Stand, several custom adapter plates needed to be designed and manufactured to mate the high vacuum diffusion pump and baffle to the chamber. Unfortunately, all of the components are not the same standard, necessitating the requirement of custom plates. 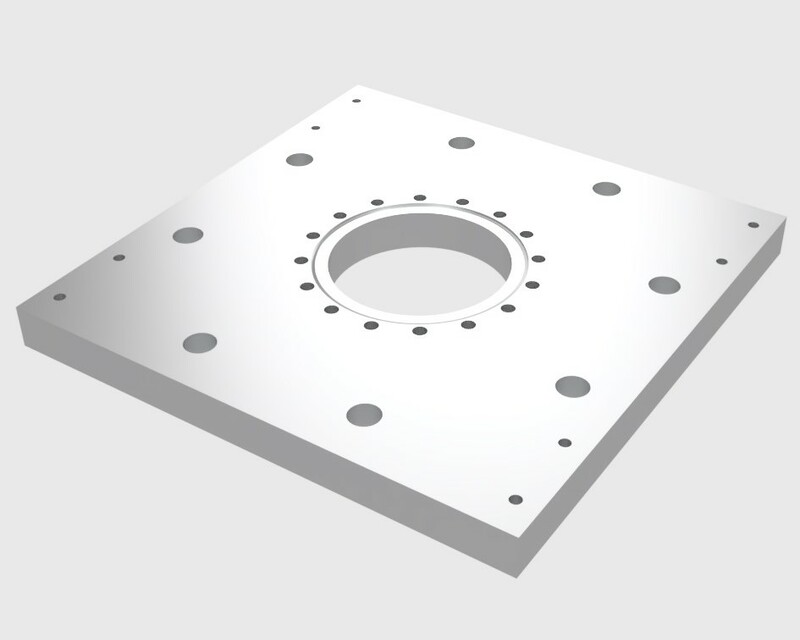 The plates have already been designed and integrated into the final cad for a while now, and can be viewed in the Integrated High Vacuum Test Stand Gallery. This post will briefly cover some of the design challenges and considerations faced for the adapter plate, and some of the solutions that were implemented as a result. Due to severe cost constraints and budget, the plates needed to be designed with as minimum manufacturing as possible, out of an affordable material. 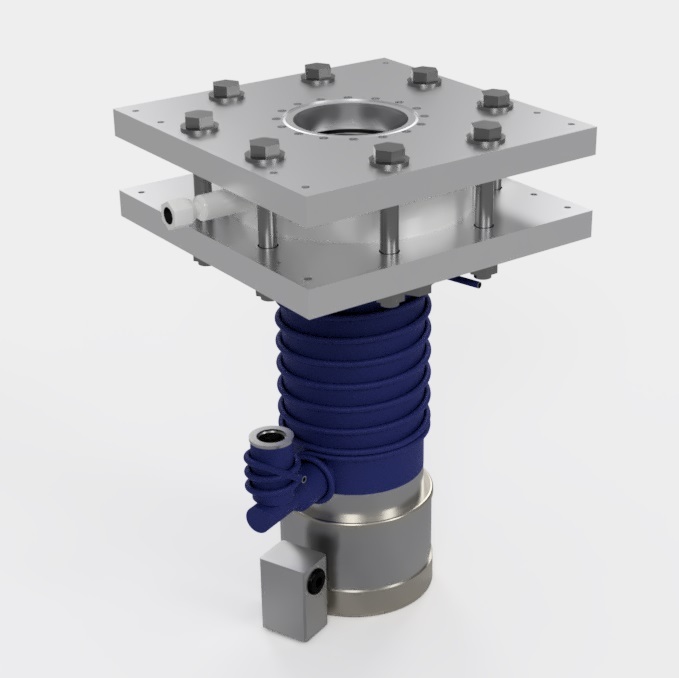 While stainless steel is the ideal choice, for the size of the plate required to accommodate the flanges and mounting holes to the 8020 test stand (12″x12″x1″), this would have been far too costly. Aluminum was selected for the material as a result of its low cost. For o-ring seals for vacuum applications, the recommended surface finish of mating surfaces is 32 micro-inch or better. ATP-5 aluminum plate stock is a type of standard tooling plate that comes with a surface finish of 25 micro-inch or better. 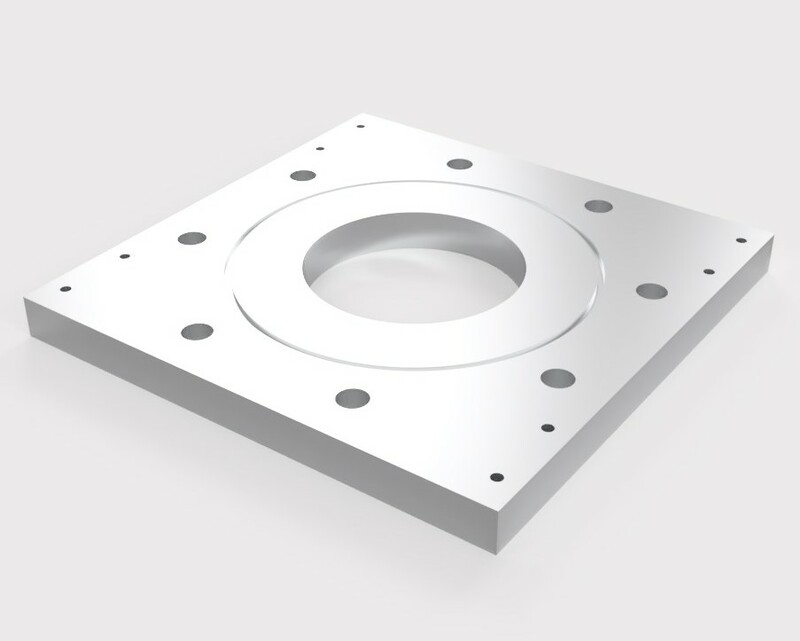 While a bit more in cost than regular aluminum plate stock, this eliminates the need for any final surface machining of the plates, reducing overall machining costs. Because I do not have the machining capabilities to do these pates myself, the machining needed to be outsourced to a local machine shop. The plate stock was purchased at a great deal of about $50.00 per plate from Midwest Steel and Aluminum during one of their daily sales. While a simple o-ring groove for the o-ring sealing surfaces is easy enough to machine, the conflat mating edge on the second plate remained a technical challenge due to the geometry and cost associated with machining the standard knife edge. 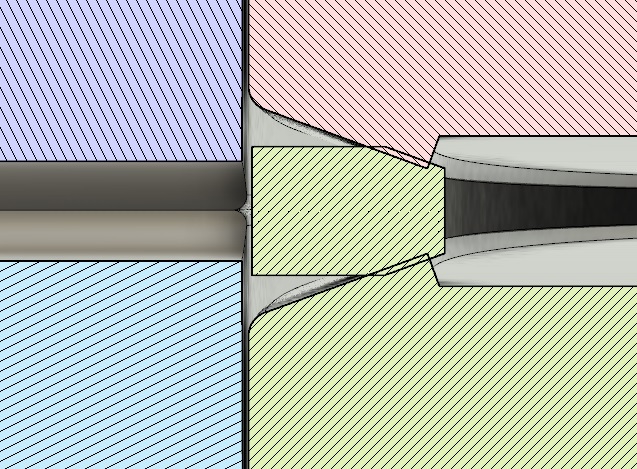 A standard sealing method in high vacuum engineering is the conflat flange. 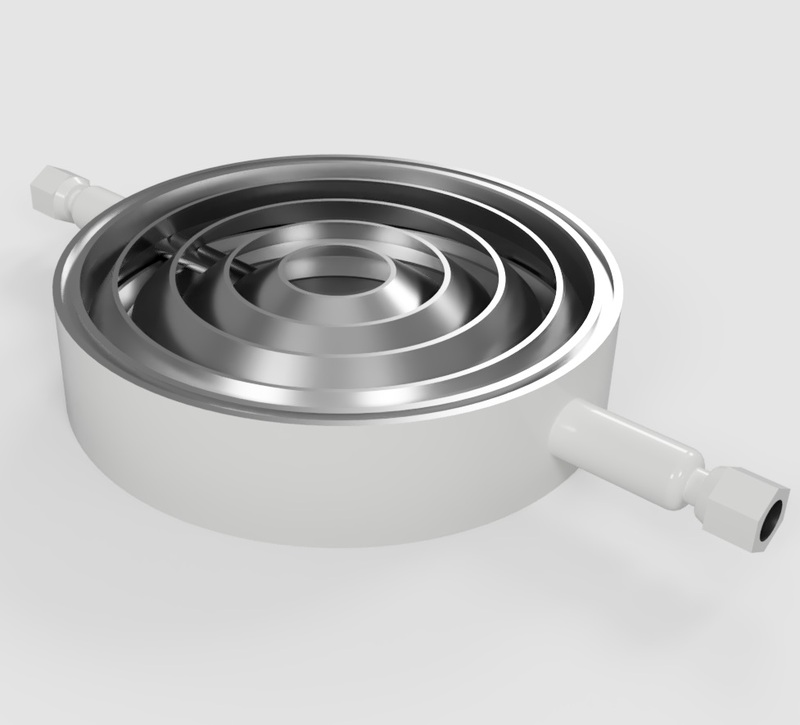 This consists of a specially formed knife edge that bites down into a softer gasket material, creating a strong, leak-free seal capable of ultra-high vacuum levels. 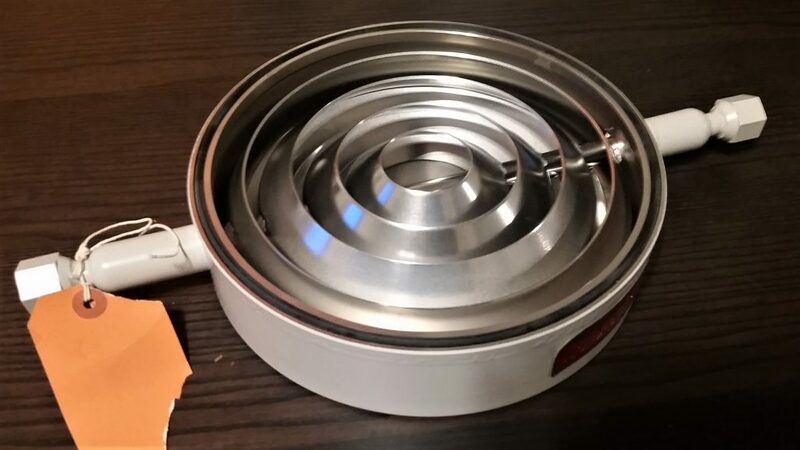 Generally, due to the large forces exerted on the very small diameter sharp knife edge, the flange must be made of a very hard material, almost always stainless steel. Aluminum knife edges do exist, however they must be hardened, and require more care in machining, and can only use either aluminum or viton seals. 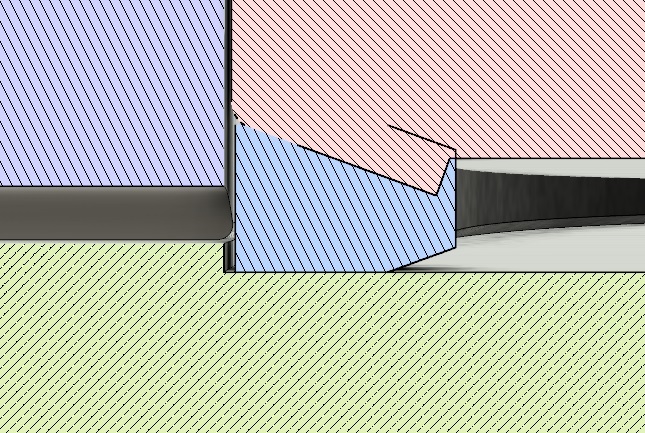 As a result, the gasket must be softer material than the knife edge to prevent damage to the edge. The default material is oxygen free copper for stainless steel. Annealed copper gaskets are also available for conflat view ports to reduce potential stresses on the glass bonded to the flange. Aluminum gaskets are also available, though less common, as well as viton gaskets. Due to cost constraints and use of aluminum for the adapter plate, hardening through some process (such as nitriding) was not possible, requiring the use of a viton conflat gasket. Quotes from local manufacturer’s for this edge were staggering, on the order of $600 to almost $1k for the plate, making it highly unfeasible on my budget of only a few hundred dollars max for both plates. Therefore, another solution was needed. With the design and analysis of the plates completed, and the plates already fabricating having written this entry, the next steps will be the assembly and preliminary vacuum testing of the high vacuum assembly. New technical challenges have presented themselves along the way, and while creating more setbacks and difficulties, has allowed for new learning opportunities. The next blog post will take a look at the newly machined plates, and the beginning stages of assembly and testing of the hardware.